I am neck-deep in updating one of my books for a new edition (Starting and Building a Nonprofit, in case you’re wondering), and during a quick New York Times break I read all about spaghetti tacos, which are apparently the rage among the tweener set. Truth be told, I don’t really find this concoction appealing — though I do quite enjoy incongruous food combinations! My contribution to the genre? Meatloaf sushi. I first created this about 10 years ago and have been meaning to post a how-to for ages. So here you go; photos and instructions after the jump. You’re very welcome. 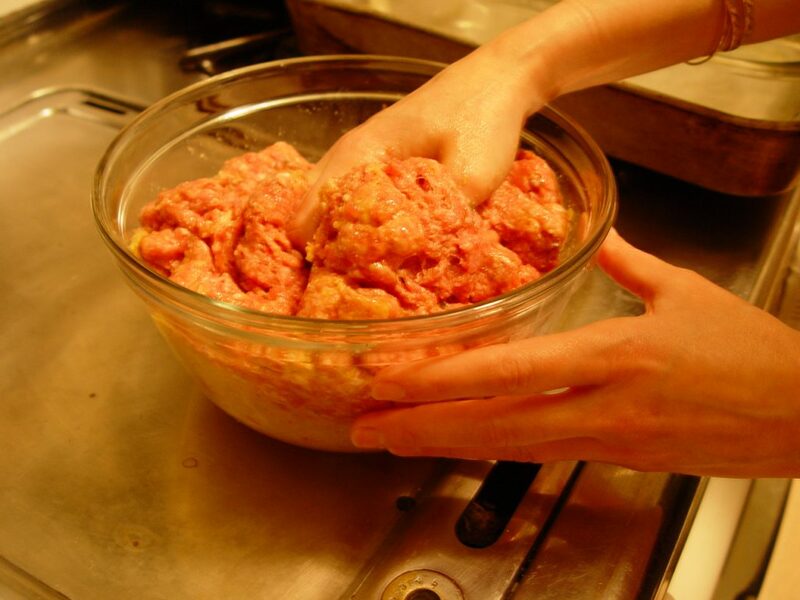 Step 1: Mix up a savory meatloaf. Use your favorite recipe, as long as it doesn't result in too crumbly or soft a loaf. 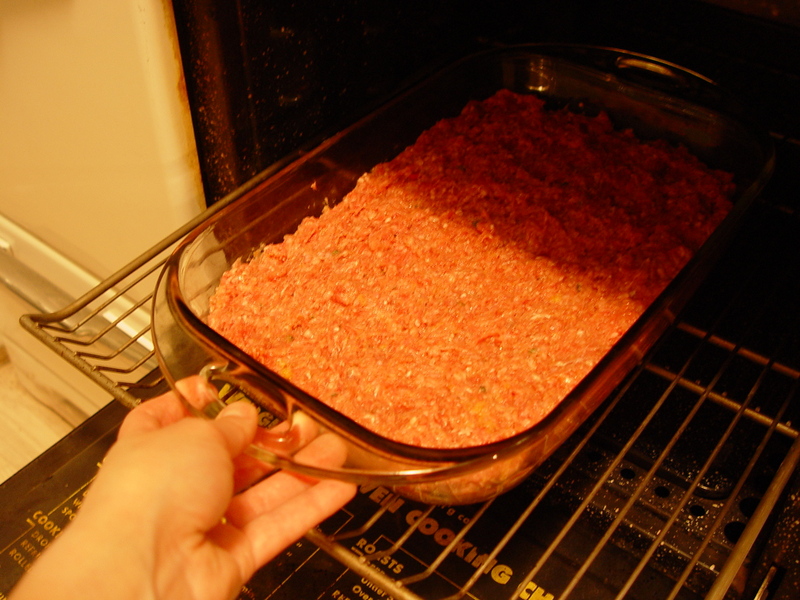 Step 2: Bake meatloaf in a shallow pan. In a few steps, you'll see why it should be on the thin side. 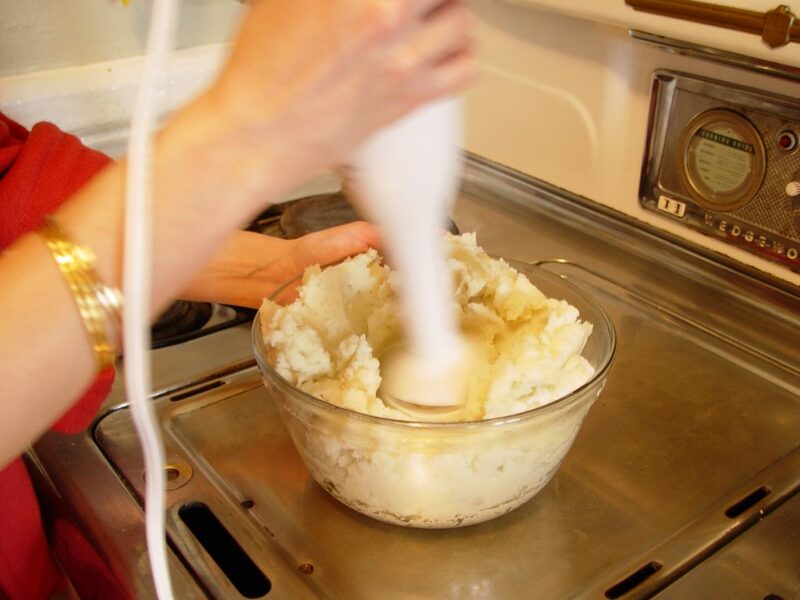 Give it a medium-firm press-down to make sure it will hold together when done. Step 3: Peel, boil and mash potatoes. I cheat with my handblender, which works well for meatloaf sushi because you want the mashed potatoes to be pretty smooth. Step 4: Form oblong potato beds. I usually make these about thumb-length. Step 5: Let finished meatloaf cool, and make gravy. 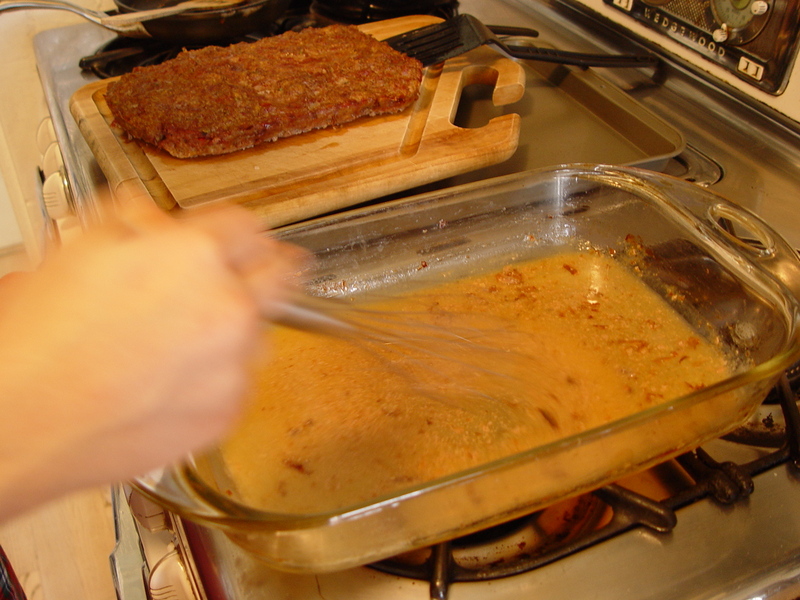 Remove the cooked meatloaf from its pan, and while it cools, use a little bit of flour and water with the pan juices to make gravy. Step 6: Slice meatloaf slabs. 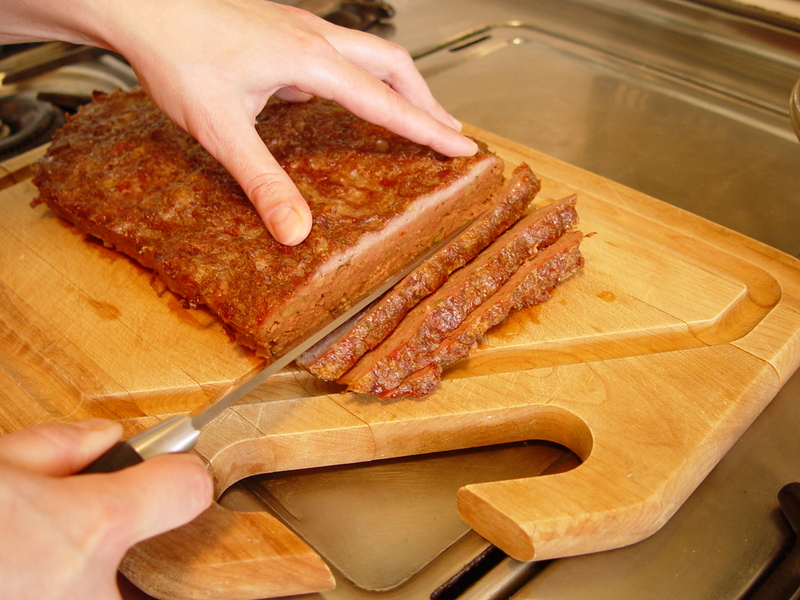 Once the meatloaf is cool enough to handle, slice it into slabs. Cut each slab into thumb-length pieces. Step 7: Assemble meatloaf sushi. 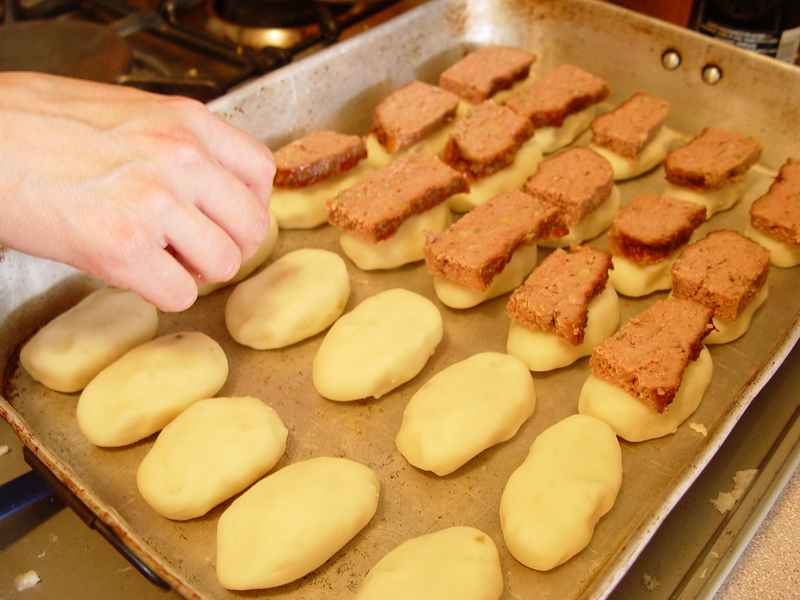 Place a slab of meatloaf upon each bed of mashed potato. Step 8: Blanch and slice scallions. 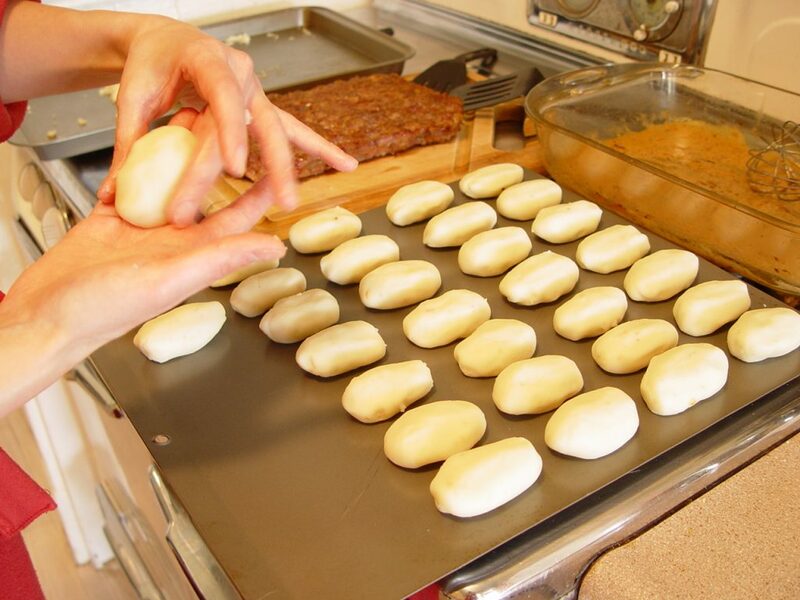 Cut them in half longwise, then press them open with your finger. If they're quite wide I'll slice them lengthwise again. 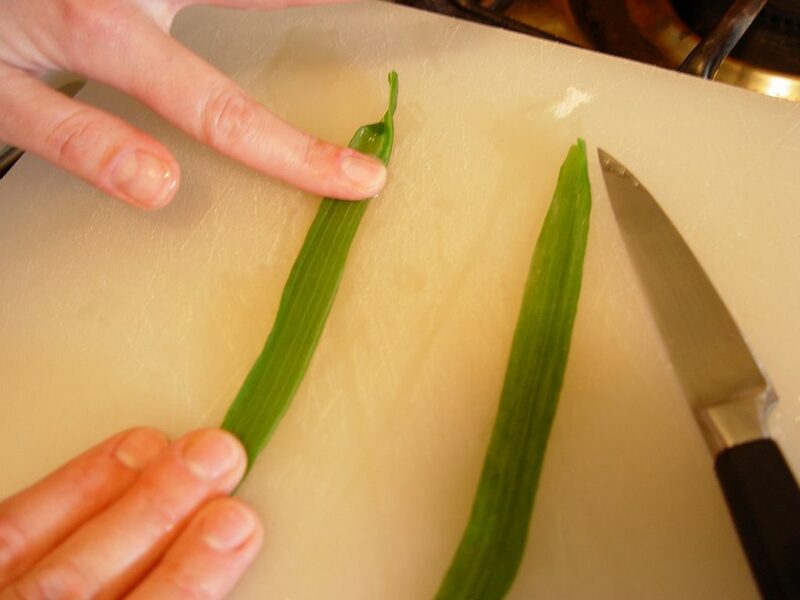 Step 9: Wrap each piece of sushi with scallion. The "wet" interior of the blanched scallion usually sticks pretty well to the potato. A little push into the bottom of each piece should do the trick. 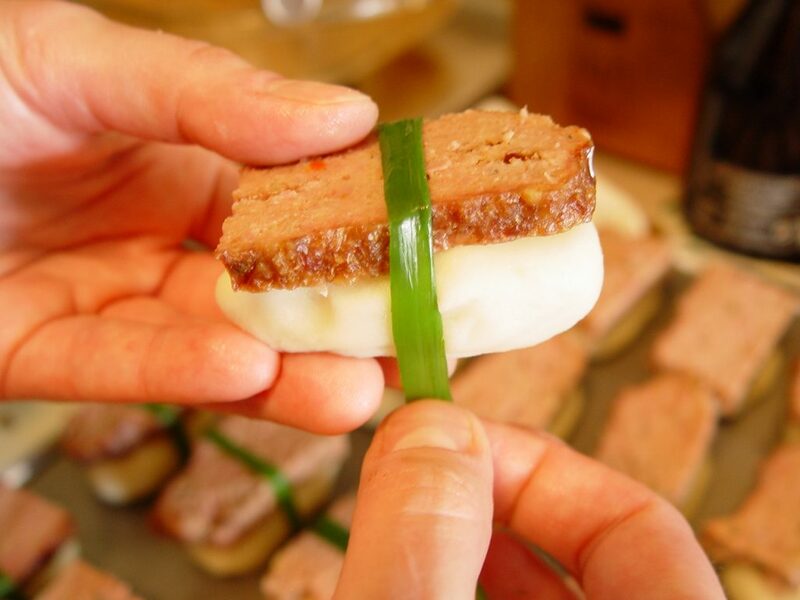 Step 10: Serve meatloaf sushi to delighted friends. Sometimes I put a dollop of gravy on each one; sometimes I serve it separately in a cute dish. Enjoy! 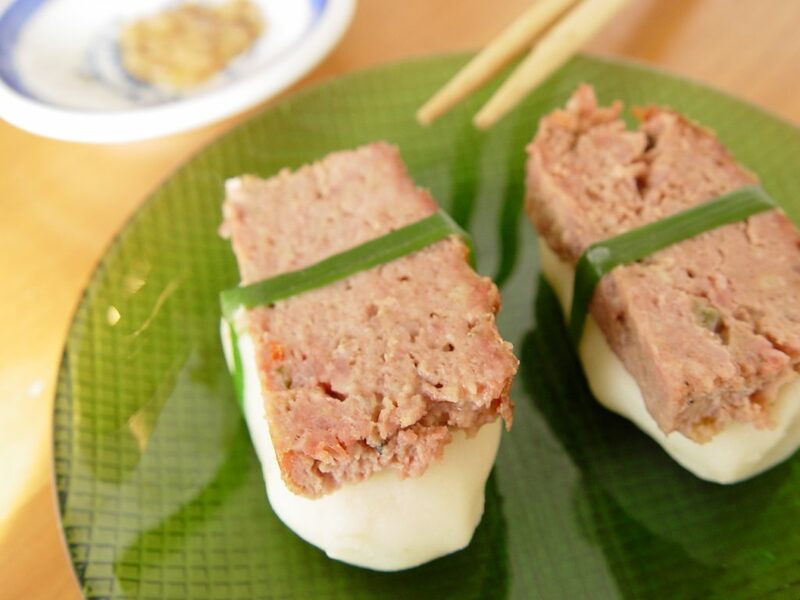 And to think I thought that I had come up with an original idea but apparently loads of people have come up with meatloaf sushi on the internet. Yours looks like the best I’ve seen though! Ha! I haven’t seen any others online but I haven’t looked in a while. I came up with it in 2000 (I remember because it debuted at our going-away party when we moved from San Francisco to New Mexico) and it has been a party fave ever since! Thanks for the compliment!